The apps use technology like predictive analytics and are for business travelers and mortgage officers, among other professionals. Apple and IBM’s enterprise partnership has yielded 10 new apps, including one that targets business travellers and others that make use of predictive analytics and iBeacons. There are four in a new category called “employee experience.” The Travel Plan iPhone app helps workers plan business travel by reviewing their calendar and identifying possible trips. The app can also look over a person’s travel history and suggest bookings for things like hotel accommodation. With Loan Advise, mortgage officers can use an iPad to gather client information in real time and offer more personalized loan information. 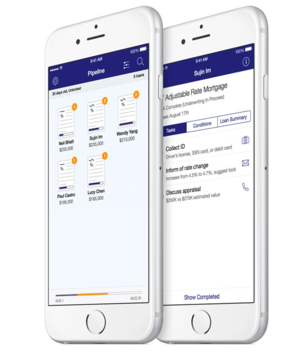 The Loan Track iPhone app lets mortgage officers review loans being worked on and see what’s needed to complete the application. The app uses analytics to prioritize what loan applications to work on based on how likely they are to close. Asset Inspect, an iPhone app, uses predictive analytics to suggest why a piece of industrial equipment, like a transformer, isn’t working and offer repair advice. The app gives technicians updates on new jobs, weather conditions and work site hazards. Safe Site is for the iPhone and lets people at job sites report unsafe working conditions. The app uses iBeacons to notify workers when they’re approaching a reported work site hazard. Finally, Field Inspect, an iPad app, lets government inspectors conduct inspections and file findings to the proper agency. An inspector can use the iPad’s camera and microphone to document inspections, and the app recommends actions based on data from previous inspections. IBM and Apple haven’t shared many customer details or if the partnership has proven lucrative. One customer is the Japanese government, which is providing iPads outfitted with customized apps to the country’s elderly population to help them manage their health. Apple CEO Tim Cook has said he sees the deal with IBM as a way to revive slumping iPad sales.